NATS Defence has announced its sponsorship of the Combined Services Cricket tour in India, which will see a team of British Army, Royal Navy and RAF players compete against Indian teams from 18 October to 2 November 2013. Ewan Kelbie, Head of NATS Defence, presented Air Vice-Marshal Paul Atherton with a cheque on 26 September at the ‘official’ home of cricket – Lords Cricket Ground. This is in support of the Combined Services Cricket team during their tour in India, which will take in locations including Delhi, Agra, Jaipur and Mumbai. NATS has been a staunch supporter of the RAF ladies cricket team for a number of years and also sponsored the combined services T20 tournament in June this year, which took place at Lords. Presenting the cheque, Ewan Kelbie, commented: “We have worked closely with the UK military on a professional level, managing air traffic control operations in UK airspace, for many years and we are delighted to sponsor the Combined Services Cricket team as they travel to India to do battle on the cricket ground. 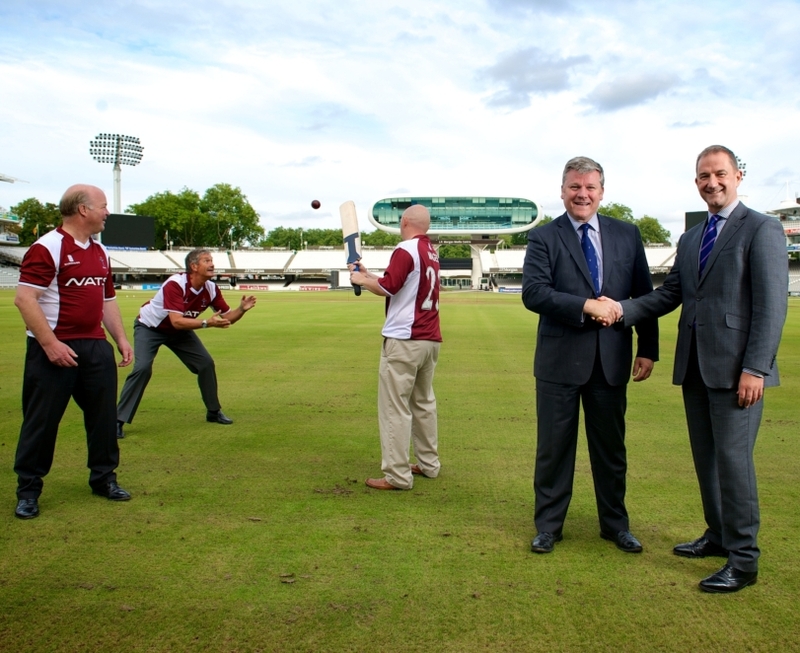 Ewan Kelbie (right), Head of NATS Defence,with Air Vice-Marshal Paul Atherton at the ‘official’ home of cricket – Lords Cricket Ground. Click to enlarge. Air Vice-Marshal, President Combined Service Cricket and President Royal Air Force Cricket Association, Paul Atherton, said: ““I am extremely pleased that NATS will be sponsoring the Combined Service Cricket tour of India this October and I am enormously grateful for NATS’ continued support to Service Sport. Without such support, the Single and Combined Services would be unable to compete at such high levels and commit to prestigious events such as the Lords Inter-Service T20 competition, and hugely important Defence Diplomacy tasks such as the forthcoming tour of India.